3 x Pack of Toggi James Mens Designer Long Riding Socks. 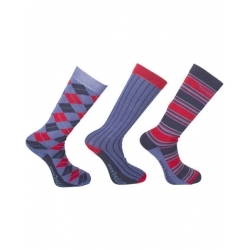 These Toggi James Mens 3 x Pack of Socks Feature Various Ribbed, Argyle and Striped Designs. The Socks Are Made From A Cotton Mix. These Toggi James Mens Long Riding Socks - Made from the Finest Quality Materials but Affordable!